I come from a family of artists. I don't mean an "artsy" family— I mean, my dad, my mom, and both siblings were artists. Very talented artists. For years, I filled sketchbooks with ill-executed doodles. I drew musclebound action heroes with giant guns, and 80's-futuristic sports cars drawn in 3/4 view, which my lack of knowledge of perspective turned into formless, shiny blobs. The fact that I found something creative to be good at didn't totally quell the sting I felt from my profound lack of visual art skills. I remain resolute in my commitment to eventually developing the latent visual arts genius that is my birthright. OK, not really, but DO often wonder how my life would be different if I'd started spitting out visceral, kaleidoscopic canvases, instead of albums. When I was 18, and had already been a musician for a few solid years, I was following my dad around the local art supply store as he picked up supplies. A set of brightly-colored watercolor crayons caught my eye, and penniless though that I was, I managed to get a set, along with a watercolor sketchbook with a black, crinkly cover. I got these new tools home, sat down with a little dish of water, and started mucking around. I laid down some dark lines of crayon and began pushing the color around the page with wet fingers. I really took to the feeling. I was left with some sort of psychedelic octopus-like blob. I loved the little traces of color I could see, where faint amounts of paint had lingered on my fingers as I moved them across the thick, toothy paper. I wanted to accentuate them. I took an india ink pen and began to draw outlines around the colorful forms. The generous, even lines seemed to make something more tangible out of these semi-random smooshings. I was very much in love with this process. I repeated it regularly over the course of a week, filling up the sketchbook. Then, all of a sudden my super-compressed teen attention span tripped closed, I put the crayons and the nice black watercolor book in the closet and forgot about them. I lost them in the bustle when I moved away from home, and I remember feeling a little pang of missed opportunity. Since then, every 5-7 years, I find myself walking through an art supply store, and I buy another set of Caran D'Ache crayons and another watercolor book. I knock out a few ephemeral abstracts, and then my super-compressed adult attention span slams shut, I shelve the tools, and I tend to move soon after, and again lose the tools in the hustle and bustle of a quick city move. Now, I hold no pretense that this is good art, or even art at all, but there is something about the process of taking these tools and doing this thing seems to scratch some sort of periodic itch for me. I tend to think that what this action satisfies is a need to explore my mind from alternative angles in times of stress and transition. When I'm facing flux and not feeling so tough, what I want is proof that there's more to me than what I perceive— that I have an ally in myself that exists below the surface of the person that I walk around as every day. When I buy this little art kit and I smoosh the colors around, I'm doing something wholly disconnected from my normal processes, and something with a reverently uncomfortable history for me. There is no screen, there are no notes, and no words, only tenuously held alien tools, and instinctual movements. I feel a tie form, fleetingly, between all the mileposts of my life as I do this, nonverbally and without thought. I smoosh and outline, smoosh and outline, and I'm always surprised with the outcome, like a bowl of tea leaves I can almost read. Kevin Kelly's outstanding gadget blog Cool Tools has published another of my reviews! SCORE! I love those guys. As I got more serious about cooking, I splurged and bought myself a very nice Kai Shun santoku - like the Tosagata Hocho, previously reviewed on Cool Tools. I used its preternaturally sharp edge with joyous dispatch for about 6 months, until I woefully cut some citrus with it and left it dirty overnight, eroding that wonderful edge. I've never been able to get that magic edge back, even with pro sharpening. On a visit to a local Asian market, I found a series of Thai-made Kiwi brand knives. In the store, they were nearly free: The large tapered chef's knife (model #21) that soon stole my heart cost around $4, and the paring knife was $1.50. 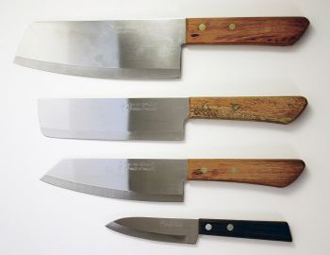 These knives are very sharp and schuss through veggies and meats like it's nothing. Don't go hacking at bones with the thinner models, but Kiwi also makes quite usable cleavers (for around $8). The miraculous part is, the knives hold an incredible edge for months with proper use of your steel, and they take a new edge with aplomb after a few strokes on a stone. I have owned knives by Wusthof, Kyocera, Calphalon, and Ikea (shudder) and the Kiwis are the most consistently sharp, most durable, and have the most effective shapes. I've bought or suggested them for all of my foodie friends, and people can't get over how wonderful they are. They don't look like much, but they're well-balanced, very sharp. It doesn't hurt that I could have picked up a full set for less than my crappy block-o-food-manglers cost 10 years ago. As far as longevity goes, I've had my main chef's knife for about four years, have steeled it every time I used it and given it a few good hones on my Spyderco Sharpmaker. It's still wicked sharp, and while I haven't babied it, it looks none the worse for wear. I used my paring knife to whack the lid off a persnickety glued-shut can of Lyle's Golden Syrup, and in my zeal, the tip bent over almost double. I thought, Oh no! but then I bent it back in place with a pair of pliers, and it's basically good as new. They're definitely the Jeep Wranglers of the kitchen. I suggest buying them locally if you live in an area with Asian markets; if not, they can be picked up online at generally higher prices. I'm working on some animation sprites for a one-week game dev contest called PyWeek. It's my first time drawing pixel art, my first time animating it, and wow, this is fun. After a search for the optimal pixel art tool, I found GraphicsGale, one of those tools you know was created by a user, for users exactly like them. It's simple, it addresses animation really well, and the tools are geared specifically for dealing with individual pixels. I used the free version, and found it a (somewhat anachronistic) joy to use. While I've always spent a lot of time computing, the precise, all-day cursor movements of professional writing and designing (a recent switch) got me vexed with my previous mouse's lack of control and an aching wrist. After borrowing a friend's $70 trackball and enjoying the fingertip control and comfort, I set out to get tracking at the lowest possible cost and highest possible comfort. 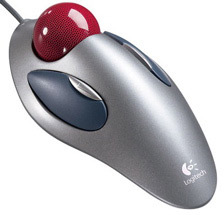 I settled on the Logitech Marble Mouse. Shaped like a low, oval hill, this $20 mouse is a nice inverse of the natural curve of a hand. The trackball sits naturally under the index and middle fingers and moves very smoothly. The sizeable left and right buttons are situated directly under your thumb and ring finger, while the two smaller buttons above them can be designated for a variety of functions like scrolling and zoom. The symmetry also makes it ambidextrous, which is great for any left/right-handed families that share a home computer. I did try a few thumb-operated trackballs, but a slight weirdness in my right thumb joint causes some discomfort when I move it a lot. Every time I put my hand on the Marble Mouse, I'm able to keep it totally relaxed. The mouse is large enough for comfort, but still relatively small enough to take on the road. The build quality is solid, and it's easy to clean. Best of all, my wrist no longer smarts after a long day's editing. Bonus: the heavy, low-friction ball makes a nice desk toy when you need a break. All throughout my life, there has been an implied expectation that technology would eventually render paper obsolete. Paper chokes the world's landfills. Paper mills are dirty, old-world consumers of forests. Paper is inherently transient, disposable, flammable, and difficult to store, index, and search through. Think of the sparkling promise of the Paperless Office. No truckloads of tree products schussing through corporations like so many laxatives. Minimalist spaces, informed only by a sleek, all-knowing screen. E-book readers, online encyclopedias, web media, and e-mail have put several nails in paper's proverbial- and not for no reason, right? However... The other day, I was at a meeting, and found myself the only person with a composition book instead of a laptop. My eyes were, largely, looking at the people in the room, with breaks here and there to jot things down. My compatriots all sat, with eyes like iridescent marbles, three-quarters of their focus on the glowing displays in front of them, with only a detached involvement in the conversation. This behavior is not uncommon. Apart from the absence of distraction a simple tablet of paper affords me, it also offers an easy, automatic kind of information management. While those with laptops saved and closed their documents, went back to their offices and changed gears entirely, I had an open comp book, with the details of the meeting, sitting on my desk. I have an unwritten contract with my comp books. If I write something in them, it tends to be topical. Daily to-dos, edits for documents, info from meetings, ideas, thoughts. My agreement to myself is to keep the content of the moment on one page, and to keep the book open to that page until I've done the to-dos, processed the info, expounded on the ideas, milled through the thoughts, etc. Once that's done, I turn to the next page and start again. I have what I consider to be pretty tremendous focus, but it has but one track, and the sanctity of that track must be defended to the death, lest I paralyze myself by scattering it. The act of keeping that doc in the buffer, that pea under 12 mattresses, can wreak havoc. So instead it sits, inscribed in my never-advanced-past-4th-grade chicken scratch, on a pad of paper that is always on my desk, telling me, "Hey, when you've got time, just glance over here and take care of what I've got for ya. No rush." Sure, some folks may do a variation of this by having huge monitors, or perhaps several, with all kinds of data sprawled across them for easy review. That's fine, until you have to reboot, and thus, remember what you had open. Or if, even worse, you're not diligent with the save button and you lose some ephemeral-but-vital thought to a crash. To me, a few comp books are the cheapest big, daylight-readable, eye-friendly portable monitors I can think of. You can have one for each stream of thought you deal with on the daily, one for every project, one for the daytime, one for night, whatever you want. They are your buffers. Use them as you will. There are other pluses for me in all this. For one, digital data is, by its very nature, ubiquitous. Your work comes home with you as naturally as the mud on your Chucks. For today's workaholic culture, that means there's no end to the chances you have to ruin a perfectly good weeknight, knocking out those last... few... i-dottings... and... t-crossings. Why not? Hell, it's there and it beats petting the cat, right? WRONG. The cat needs petting, and you need a BREAK. With the minutiae of your work sitting inexorably, physically at work, intentionally inaccessible, you've earned yourself a reprieve. Probably the biggest upside to this for me is this: I have a finely-honed ability to distract myself- To close that important doc and file it away "for later". I often won't see it again until I chance upon it weeks later, practically shaking with self-annoyance, when it no longer applies, tasks left undone and ideas damp and dormant. With this paper buffer system, the data is there, in front of my face. All I have to do is agree not to turn the page until the page has been processed.